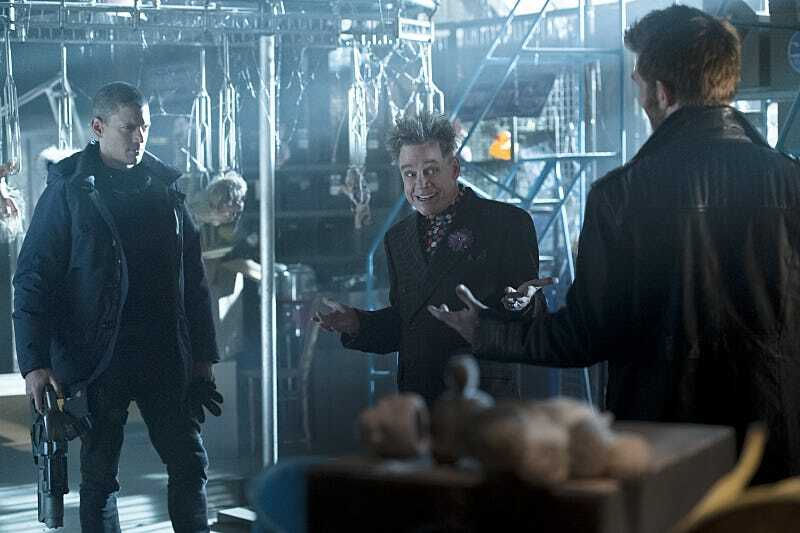 This Week's TV: Mark Hamill Leads The Greatest Villain Team-Up In TV History! Plus Robot Chicken is back with more weird superheroes! There are midseason finales of all your favorite shows. A killer is finally unmasked on Scream Queens! Neon Joe, Werewolf Hunter arrives in a four night miniseries event! But will Felicity Smoake go up in gas on Arrow? It’s this week’s TV! Supergirl vs. Jem?! No, it’s JEMM! The evil Saturnian analogue to the Martian Manhunter! He’s truly crustaceous. Truly, truly, truly, crustaceous…. A four-night special event, co-starring Damien Young, AKA, Bus Driver “Stu” Benedict from the Adventures of Pete & Pete! Trickster! Captain Cold! Weather Wizard! The first Rogues team-up you’ll actually care about! “Everything is in order. Or so it seems.” Sounds ominous! The killer is finally unmasked in the Scream Queens season finale! Liv, Detective Babineaux, and Ravi, work together in solving the murder of Chris Allred (guest star Jay Hindle), who was a high school shop teacher by day, and a vigilante crime-fighter named “The Fog” by night. Liv gets into trouble while on superhero brains and becomes a little too much for Clive to handle. Meanwhile, Major (Robert Buckley) has an eye opening conversation with a new friend. Lastly, Blaine (David Anders) forces Liv to do the unthinkable. Some iZombie trivia: “Chris Allred” is, of course, a portmanteau of writer Chris Roberson and illustrator Michael Allred, the creative team behind the iZombie comic book series! An interplanetary rescue mission on a planet of evil! Bring ‘em home alive. Trapped under glass, in a set piece reminiscent of The Wrath of Khan’s tear jerking finale…things look pretty dire for Felicity this week. And it’s our final episode of the year! Q: Why is Oliver like a sad noble gas? The working title for this episode was “The Secret of Prisoner X”, so…spoiler? The Countess is getting married…but will she live through the honeymoon?! It is time for final justice and PC Principal comes down with complete vengeance. “The citizens of South Park feel safer when armed,” reads the synopsis of “South Park” Season 19, Episode 10 finale. Whoa! Followed by a new Moonbeam City. Someone’s eating mall Santas in the Christmas midseason finale! Dame Judi Dench! Dustin Hoffman! James Corden! Roald Dahl’s Esio Trot makes its US television debut. El Rey is here to help you get into the Christmas spirit. And stay up till 4AM for Lucio Fulci’s City of the Living Dead! Nick and Hank investigate a string of targeted attacks on Wessen small-business owners! Can the Wesen unionize in time? Ash gears up for his next gym battle against Olympia! Team Rocket turn up, naturally. The Rangers fight Greenzilla, an outlaw carnivorous plant!